The rapid growth in the use of applications has significantly added to the digital clutter that exists on people’s digital devices: for example, users typically install 12 Android apps every month but delete only 10, in effect adding two apps to their device on a monthly basis. As a result, some apps are left unused and idle on digital devices: On computers, at least 30% of installed applications are never used. The danger is that apps remain active even though the user is not using them: on average users have 66 apps on their Android device, but an experiment which installed a representative sample of 66 of the most popular Android apps, found that 54 of them consumed 22Mb of traffic per day without a user even interacting with them. Poor user maintenance of device content also generates a build-up of digital clutter: although in 55% of cases people regularly revise the contents of their device and delete unused docs and apps, in 32% of cases people only do this occasionally and in 13% of cases they try not to delete any docs and apps at all. Improper app hygiene extends to managing apps: the survey found that 65% of users update apps on their smartphones as soon as they are released, but 24% only do so when they are forced to. Moreover, only 40% intentionally adjust apps settings of each application on smartphone. This can be a problem because apps have access to user sensitive information: 96 in 100 Android apps start working without users launching them, and 83 in 100 have access to sensitive user data such as accounts, contacts, messages, calls, files stored etc. Some of the major problems that result from digital data overload are an increase in intrusive and unsolicited ads that often use vulnerabilities to penetrate the device: this was cited by survey respondents as a problem on smartphones (61%), tablets (47%) and for computers (55%). Other prominent threats highlighted were devices developing glitches (38% on smartphone) or a malware infection (28% on computers). This digital clutter and careless user behaviour is leaving devices — and the sensitive information they contain — vulnerable to security threats: our survey reveals that over half (56%) of users have lost data on their smartphone, over a third (39%) on tablets and 51% on computers. The digital age has created a mountain of digital clutter, and the explosion in the use of applications means that an increasing amount of information is saved on smartphones, tablets and personal computer devices. Whereas, once upon a time, users quickly reached the storage capacity of their phone and had to make space available for new data, today capacity is less of an issue so people take five photos instead of one, “just to be sure”. More space and power equals more data and apps. Personal and sensitive information, such as address book contacts, text messages, videos and photos, now clutter our digital world, but failure to look after this information is putting it at risk. As much as in the physical world, users need to take the cleaning of their digital ‘home’ more seriously. Just like a clean, uncluttered room breathes fresh energy into your home and life, in the same way, an uncluttered computer or smartphone results in a more enjoyable and productive experience. Digital clutter is a phenomenon that is the result of poor user device maintenance. Maybe because users no longer have to worry about storage limits, they’ve become lethargic about reviewing and protecting their devices and updating the apps. This means that, increasingly, our digital junk sits on our devices or in the cloud in perpetuity. The problem is that the more we accumulate digitally, the more people open up their device to security threats that risk sensitive data, such as passport and credit card information, falling into the wrong hands. That’s why users should take time to update and delete unused apps for the essential care of their device. The purpose of this study is to find out the extent to which users are drowning in digital clutter. We aim to reveal what problems this causes users and offer some useful advice on what can be done to improve the security and safety of sensitive information. 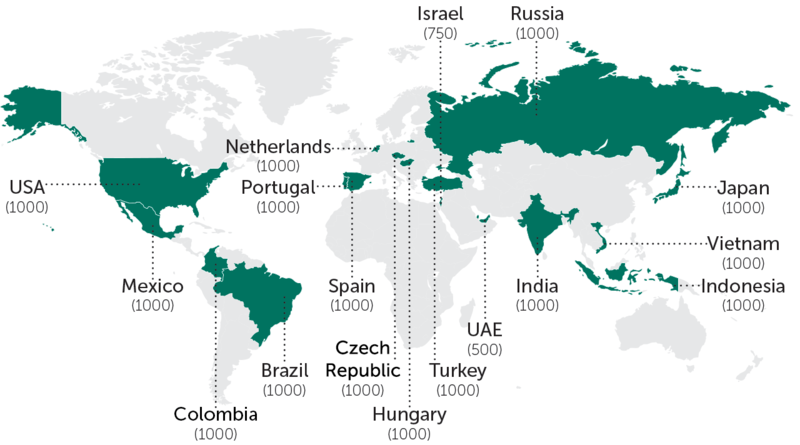 Statistics from the Kaspersky Security Network, a cloud-based system that processes depersonalized cyberthreat-related statistics received from millions of Windows and Android devices owned by Kaspersky Lab users across the globe. A real-life experiment on Android devices that analyzed the performance of applications was conducted in January 2017 by Kaspersky Lab internal testers. An online survey conducted by research firm Toluna and Kaspersky Lab in January 2017 assessed the attitudes of 16,250 users aged over 16 years old from 17 countries. Data was weighted to be globally representative and consistent, split equally between men and women. Not all the results from each study have been included in this report. To request further data please contact Kaspersky Lab at prhq@kaspersky.com. These days our devices are used as storage for all aspects of our digital lives. Users tend to save everything, even things that they know, deep down, they’ll never need or be able to find. They save files downloaded, apps, emails archived, photos taken and even those funny videos of cats! This type of data is a major contributor to unnecessary clutter on our devices. But unlike clutter in the real world — where stacks of papers, books, clothing and other assorted junk can be physically seen — there are no obvious outward signs that could indicate a problem. Our global online survey shows that a large majority of people store a wide range of information on their devices. Overall, the most common items stored on digital devices are general photos and videos for nine in ten (90%) of respondents. This is closely followed by personal emails (89%) and photos and videos of travel (89%), address book information (84%) and personal text or messages (79%). We found that in almost two thirds (62%) of cases users have their passwords, including auto-login for websites and apps, stored on their devices. More than half also store financial and payment information (62%), or scans of their passports, driver’s licenses, insurance certificates and other sensitive documents (57%). We see differences from country to country. For example, scans of sensitive documents are particularly popular for users in the UAE (87%) compared to Japan (32%). Similarly, the storage of private and sensitive photos and videos is less big in Europe (48%), than in Russia (67%). In the face of this ever-increasing mountain of data, we set about understanding how often users tend to wipe data and apps from their devices. Overall, the survey found that in only 55% of cases users said they regularly revise the contents of their device and delete everything they haven’t used in a long time, and in a third of cases (32%) users said they do this occasionally, for example, when they don’t have any more space available. Worryingly, in one-in-ten (13%) cases people said they never delete anything. A few years ago it would have been hard to predict the rapidly exploding app industry, but there’s no sign of any slowdown in its growth yet. Apps are available for all areas of digital life, from fitness trackers to productivity tools, and from travel planners to social media. The apps and the data they accumulate leads to digital clutter that can rob phones of performance, decrease available storage space and put users at risk of security threats. 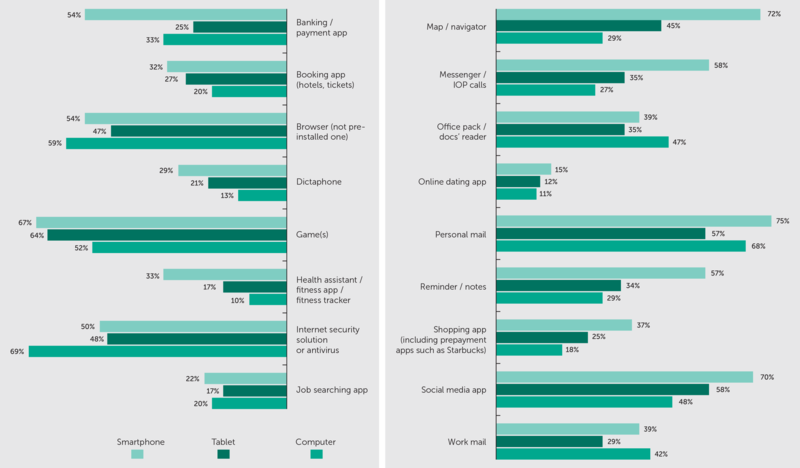 Different pieces of research conducted by Kaspersky Lab show that the apps and programs used vary according to device. Generally, and perhaps unsurprisingly, we see that PCs are mostly used for work, tablets for entertainment and smartphones for communication. Moreover, in our survey we see that the build-up of digital clutter is most acute on the device we carry around with us all day — the smartphone. Smartphones are the devices that typically have many apps that contain the most sensitive user data, such as contactless payment information or private photos and personal messaging. However, we can reveal that large groups of users fail to undertake the basic procedures for keeping this device clutter-free and therefore less vulnerable to security threats. Research based on data from the Kaspersky Security Network (KSN) shows that, on average, users have 66 apps installed on their Android device. However, in the survey users say they only have 15 which perhaps suggests that users aren’t aware of the number of apps, and therefore the volume of data, they carry around with them. We see that, on average, users typically install 12 apps on their Android devices every month but delete only 10, in effect adding two apps to their device on a monthly basis. With users adding more apps and more data to their devices every month, attitudes to app cleansing are important in order to combat the problem of digital clutter. The survey showed that although three quarters of users (77%) have deleted a smartphone app within month period, 12% don’t remember when they last deleted one. The smartphone is the device that is cleaned most often: for example, 26% of users do not remember when they last deleted an app from their computers. People probably clean smartphones more often because there is less space available: 35% deleted an app from a smartphone because there was no more space, compared to just 13% on computers. This point is supported by KSN research that shows computer applications are often redundant on the machine. We found that people never use at least a third (30%) of applications installed on their computers over a six-month period (excluding drivers, runtime software and other programs users do not work with directly). Best practice for the general maintenance of applications installed on devices requires people to understand user agreements and adjust the settings for apps. However, we found that only a third (32%) of respondents read agreements carefully and are able to decline installation of the app on their smartphone if they are not satisfied. This is important because apps have access to a lot of sensitive information on devices. Furthermore, the survey found that under half (40%) intentionally adjust the settings of each application on their smartphone. This is particularly popular in the US (48%), UAE (46%) and Asia-Pacific (44%) rather than in Israel (26%), Japan (33%) and Russia (36%). App settings enable the user to manage how the app interacts with the device. For example, apps can get access to user sensitive information, track user locations and share user data with third party servers. Failure to manage these settings can result in unused apps gaining access to information on the device without the user being aware. The issue of app cleansing and maintenance is important because, for the smartphone in particular, they contain the most sensitive data and are constantly with us. Improperly managed smartphone apps also represent a security threat because they often transmit data even when they’re not being used. Kaspersky Lab set up an experiment to test how the world’s top Android apps, defined by KSN statistics, behave in a variety of circumstances. We downloaded 66 apps (the average number of apps installed on one Android device) selected according to popularity. These top 66 apps in total took up about 5GB of storage. The devices were formatted, fitted with SIM cards and restarted, connected to the mobile Internet and with Wi-Fi set-up. None of the third-party applications were launched by testers and we recorded figures for the data usage of each application. Of the top 66, only 12 applications didn’t have any traffic consumption. But interestingly, on average, the remaining 54 run without user consent consuming 22Mb of traffic per day without a user even interacting with the apps. The resulting impact on the device includes issues with performance and battery life. This is backed up by the technical findings of the KSN research. Analysis shows that of 100 Android apps that users can manage through installing, deleting or updating, 96 start working without users actually launching them manually. Furthermore, 83 in 100 have access to user sensitive data, such as contacts, files and messages, and can even make calls and send SMSs. This is a tempting prospect for cybercriminals looking to exploit sensitive data. These findings highlight the importance of managing and deleting unused apps, because they are often working in the background, even if the user is not aware of it. It is important for users to update apps as soon as new versions are released because they might include security patches that prevent or reduce vulnerabilities in the app. We found that 65% of users update apps on their smartphone as soon as they are released, while a quarter (24%) only do this when they are forced to. The trend for updating apps as soon as they’re launched was found to be particularly strong in the UAE (78%) and Latin America (68%), when compared to Russia (55%). In contrast, computer users are less likely to update apps. 48% of users update apps as soon as possible, 30% do this only when they are forced to, and 12% try not to update apps on their PCs at all. According to KSN stats, no more than half of users install updates for the most exploited software (such as pdf readers, browsers, etc.) on their computers during the week after these updates are released. The most popular apps on the app stores issue updates that will often include relevant bug fixes as frequently as weekly, while other release cycles may happen every few months. In fact, Kaspersky Lab’s study into app usage revealed that, on average, the most popular 300 Android apps are updated every 45 days. However, we also show that 88 apps from this list are never updated, leaving them — and their users — at risk of exploitation by cybercriminals. This is risky, because apps that are not updated are doors for malware to exploit vulnerabilities in the apps and OS as a means of penetrating the device. In 2016, four million exploits were detected, which is 16% more than in 2015. Overall, in the last year Kaspersky Lab’s solutions combated 758,044,650 attacks on Internet users around the world, and many such attacks were using vulnerabilities in software and OS. The phrase data obesity has been coined in recent years to describe the way users clutter digital devices with excess information. The analogy implies that you may be continually snacking on new information which may provide very little value in your life — and then creating a number of problems by storing all that nutrition-less information on your devices. Users exhibit careless behaviour towards the hygiene of their devices despite the fact that we found fears over personal data loss are well founded across all digital devices. Our survey reveals that 56% of users have lost data on their smartphone, 39% on tablets and 51% on computers. In most of these cases, data was deleted because of a damaged device or a user accidentally deleted it, and the third most common reason was malware infection. We noticed vast differences between users in different countries, however. For example, in the case of smartphones, we found 73% of those in the Asian-Pacific region have lost data in contrast to 44% in Europe. A wide range of other problems associated with digital data overload are also highlighted in the study. For example, the main problem with devices cited by respondents was intrusive and unsolicited ads, for smartphones (61%), tablets (47%) and for computers (55%). These ads often use vulnerabilities to penetrate the device, and in 2016 the most popular and dangerous mobile Trojans were advertising Trojans that can obtain superuser rights on the device. Users highlighted problems with battery life, lack of memory and unsolicited ads on smartphones more often than on tablets and computers. This is caused by poor device maintenance and happens when users fail to delete apps and update them, opening the device up to security threats. At the same time, computers faced glitches and malware more than smartphones and tablets. This report demonstrates the scale of the problem with the data that permeates across all the devices that help us to manage our digital lives. Digital clutter is increasing and so are user problems associated with it. User behaviour and attitudes to applications are the source of many of these issues. Many users fail to undertake the simple but essential care of their device that cleans and updates software and apps, adjusts settings and uninstalls unused apps. These actions are important to the hygiene of devices and the data that exists on it — from phone through to tablet and computer. Just as it’s become traditional to clean out our closets, attics, and garages each spring, it’s good practice to regularly clear out and refresh digital spaces. It keeps them running smoothly and protects security, so spending a little time to get your digital house in order could prevent you from losing important or sensitive information in the future. With time, we’ve unknowingly accumulated mountains of unwanted data that could leave us exposed to ever-increasing cybersecurity threats. The digital world is growing and so is our capacity to store this data. But the fact that we have the capability to store vast information doesn’t mean we should. Complete an audit — ensure you know what information is stored where. This will help you to clean devices more easily and give you peace of mind that your data is secure. Clean your device — once you know where everything is stored, it is easy to delete unused and unwanted files and apps that may pose a risk to your device. Update software — regular updates should be undertaken as soon as new versions are released. Use dedicated software — software cleaners such as the one integrated into Kaspersky Lab’s flagship security solutions, scan all applications installed on your device and mark those posing potential risk or those that are rarely used. It will also inform the user if the application slows down the user’s device, provides incomplete/incorrect information about its functions, operates in the background, and shows banners and messages without permission (e.g., advertising). Kaspersky Lab’s flagship security solution for home users also contains an Application Manager feature that sends alerts if a program has been installed without their awareness or clear consent, for example, as additional software during the installation of another application. Is your digital clutter out of control?